In this method of prioritization, participants assign relative value to a list of items by spending an imaginary $100 together. By using the concept of cash, the exercise captures more attention and keeps participants more engaged than an arbitrary point or ranking system. 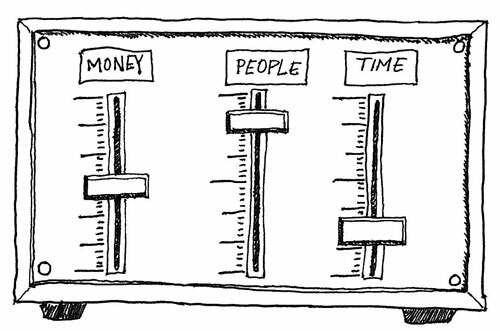 Medium; may take up to 1.5 hours for a group to decide how to spend its money and to reflect on outcomes, depending on the length of the list and size of the group. To set up the game, you will need a list of items to be prioritized, set up in a matrix with space reserved for the amount spent and reasoning why. To begin the game, explain the challenge to the group: they have a collective $100 to spend on the list of items. The dollars represent importance of items, and they must decide as a group how to allocate the dollars across the list. Give the group sufficient time to assign their values, and ask that they also write a brief explanation for the amount. 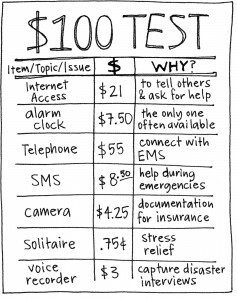 It is possible that groups may bring up the literal cost or effort of items on the list; this may confuse the primary issue of importance and it may be best addressed as a separate discussion, or as its own $100 Test. When the matrix is complete, ask the group to explain their decisions and reasoning. The matrix can then be used as a guidepost for future decision making on a project; specifically, what items are important and of higher priority than the others. This game is commonly used in software development for working with users to create their prioritized feature list. However, it can be applied in any situation where a “false scarcity” would help focus a group’s wants and needs. For example, an HR group polling employees about new benefit plans may use the $100 Test to uncover what options would be best received and why. 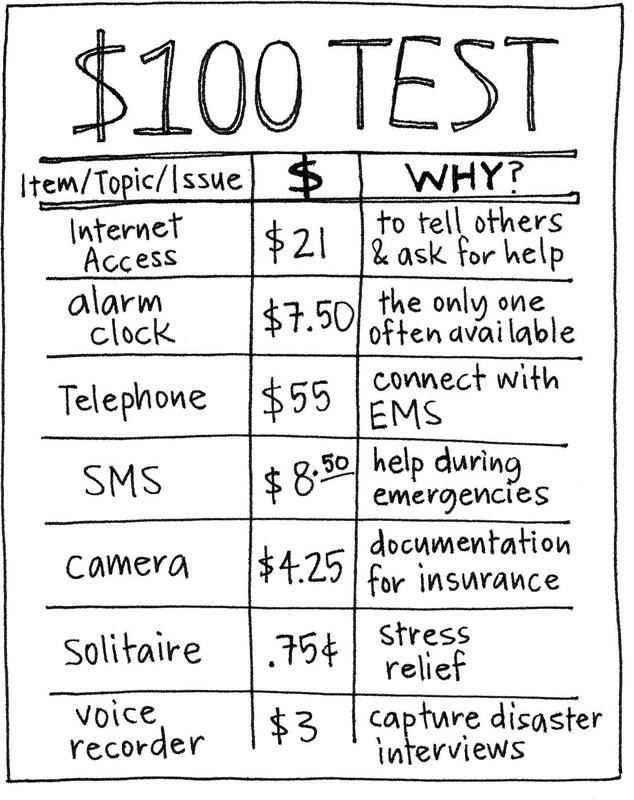 The $100 Test is known by many names, including Divide the Dollar and the short-form variation, the $10 Test. The source of the $100 Test game is unknown. 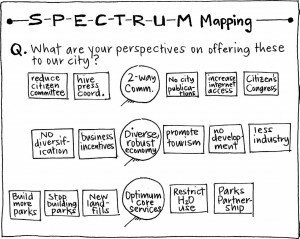 Spectrum mapping is designed to reveal the diversity of perspectives and options around any given topic and to organize them into a meaningful spectrum. This game gives players an opportunity to express their views without having to assert them vocally or even take ownership of them in front of the group. It’s valuable because it unearths information that plays a role in attitudes and behaviors that otherwise may not be visible. 1. Before the game begins, brainstorm topics around which you want insight from the group. Write each topic on a sticky note. 2. 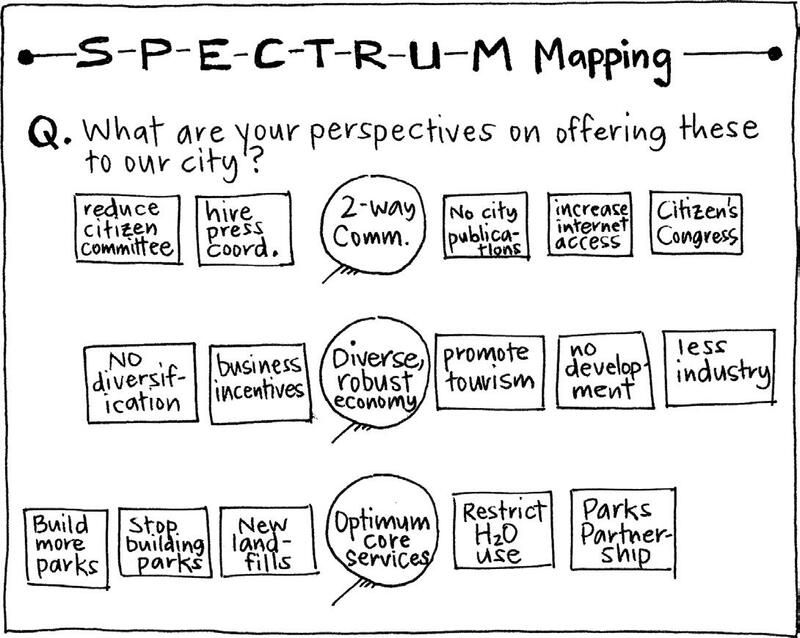 Introduce Spectrum Mapping by stating that the purpose of the game is to illuminate the team’s range of perspectives and to organize those perspectives into a continuum so that everyone gets a view of it. 3. 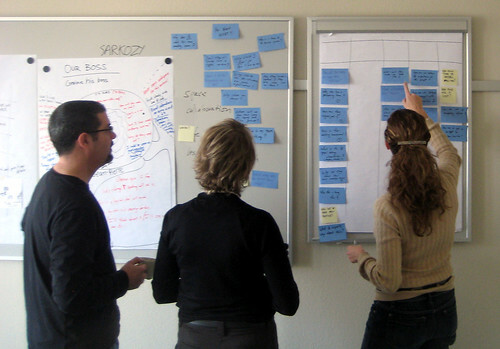 Post the topic sticky notes in a column in the approximate middle of a space on the wall visible to the players. Ask everyone to silently generate a point-of-view preference option around that topic and write it on a sticky note. They are welcome to offer more than one. 4. 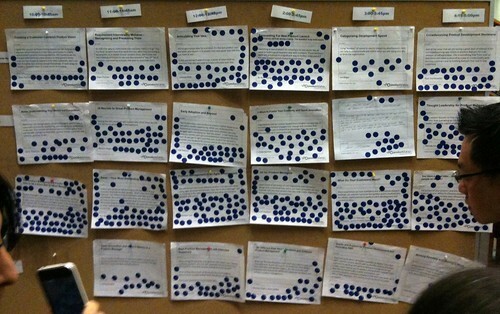 Ask the players to come to the wall and post their sticky notes in a horizontal line on either side of the topic. Reassure them that the relationships between the sticky notes aren’t yet of interest. The visual may look like the following figure. 5. Once the sticky notes are posted, work with the group to sort them into a horizontal range of ideas. Sticky notes that express similar perspectives or options should go next to each other. Sticky notes that seem to be outliers should stand alone; they may sometimes end up defining the limits of the range. 6. Continue sorting until the group agrees that the sticky notes are in their appropriate places on the horizontal line. 7. Repeat this process if you have more topics to evaluate. Once the spectrum for each topic has been laid along the horizon, ask for observations and insights on the lay of the land. 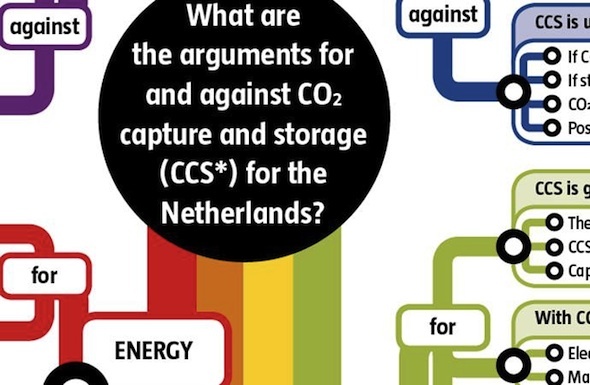 Discuss the findings with the group and ask if any perspective or option has been excluded. If so, add it and re-sort as necessary. Not only does spectrum mapping reveal individual ideas around important topics, but it also tells you how many members of your group have certain types of views and where their endpoints lie. 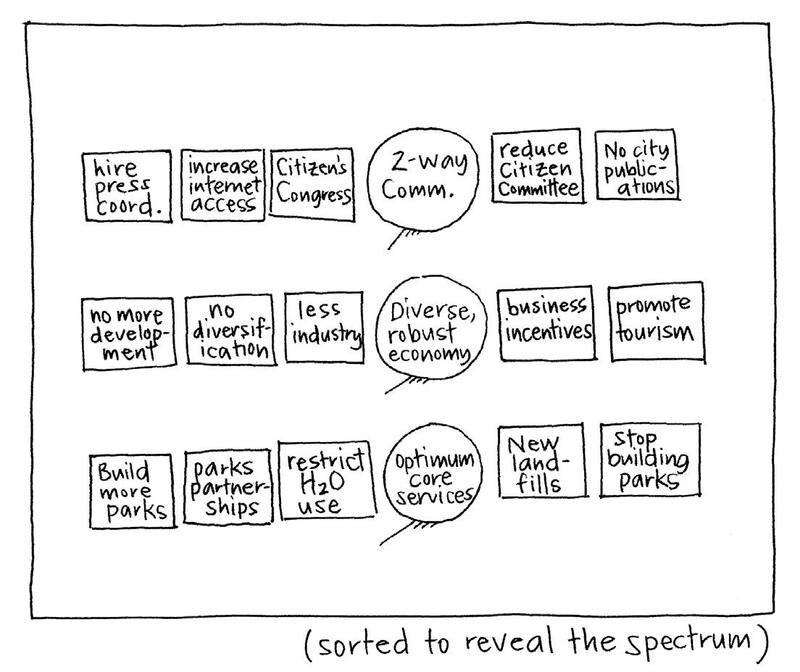 After spectrum mapping, the players are likely to discern a more holistic view of where they stand. 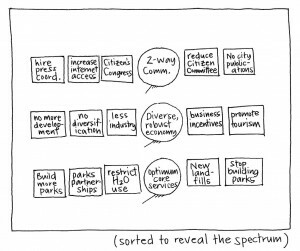 In other words, spectrum mapping indicates whether the group tends to lean a certain way—perhaps it’s fiscally conservative, oriented toward growth, or reticent about change. Either way, as a team leader, it’s good to be aware of the group’s natural inclination and openly acknowledge it to enhance future team building, problem solving, and planning. Assure the players that they’re free to write up honest perspectives and preferences around a topic even if those preferences may be considered outlandish by the other players. 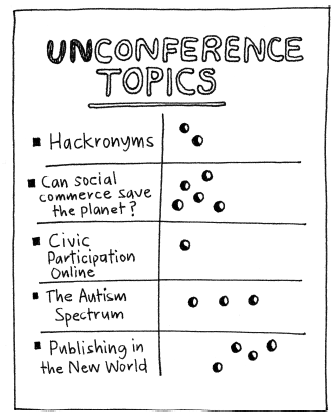 Tell them that outlier ideas still make it onto the continuum. This play is about mapping and displaying the spectrum, not evaluating ideas for validity, innovation, or popularity. This game has the effect of letting groups see if their behavior skews too far to one side or whether they’re taking a reasonable approach when a radical one may be better. The source for the Spectrum Mapping game is unknown. 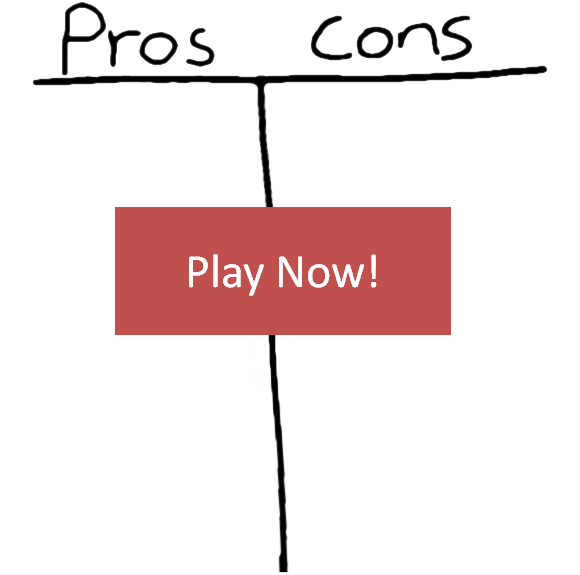 Pro/Con list, originally uploaded by dgray_xplane. Source: Mr. Franklin: A Selection from His Personal Letters. Contributors: Whitfield J. Bell Jr., editor, Franklin, author, Leonard W. Labaree, editor. Publisher: Yale University Press: New Haven, CT 1956. 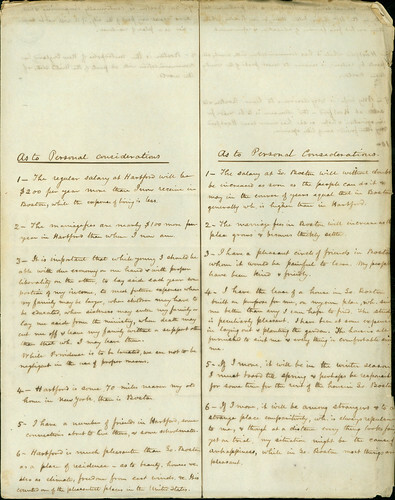 Note about the image: I couldn’t find an example of a Pro/Con list by Benjamin Franklin, but I found this image as part of a Connecticut Historical Society blog post about the Rev. William Patton, who made this Pro/Con list as he considered the relative merits of living in Boston vs. Hartford. Given Benjamin Franklin’s large and distributed social network, we’re pretty sure that he would have enjoyed playing this game with his friends and colleagues. And while dear Ben couldn’t engage his network very easily, we’re pretty sure that he’d be really happy to learn that you can engage your distributed team in an online Pro/Con game. Blue Pluses: Use these to capture Pros. Cons: Use these to capture Cons. We’ve organized this game using multi-layered regions so that you can keep track of the importance of each item. There are High, Medium, and Low importance regions on the game board. As you’re moving items around, use these regions to help you keep track of the most important ideas. 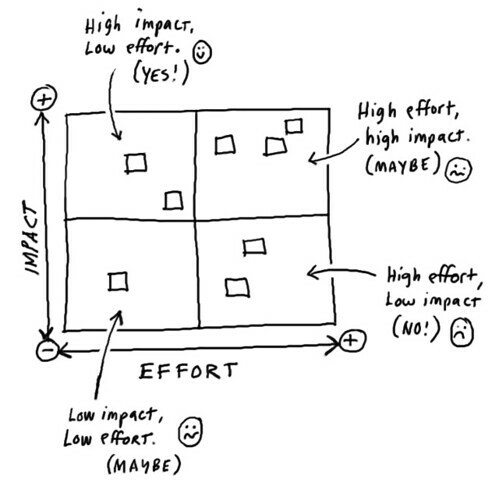 Impact & Effort Matrix, originally uploaded by dgray_xplane. In this decision-making exercise, possible actions are mapped based on two factors: effort required to implement and potential impact. Some ideas are costly, but may have a bigger long-term payoff than short-term actions. Categorizing ideas along these lines is a useful technique in decision making, as it obliges contributors to balance and evaluate suggested actions before committing to them. As participants place their ideas into the matrix, the group may openly discuss the position of elements. It is not uncommon for an idea to be bolstered by the group and to move up in potential impact or down in effort. In this respect, the category of high impact, low effort will often hold the set of ideas that the group is most agreed upon and committed to. 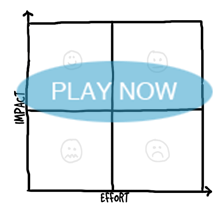 The source of the Impact & Effort Matrix game is unknown. 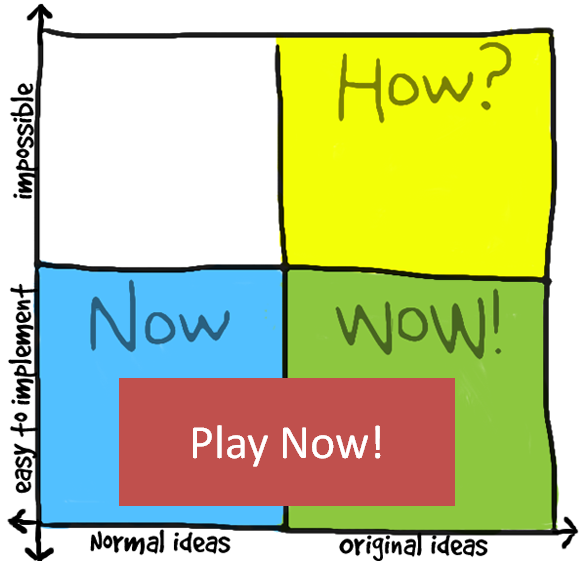 Clicking on this image will bring you to an “instant game” at innovationgames.com, where you can play Impact & Effort Matrix online. The same image will be used as the matrix, which has a different impact-effort combination in each quadrant. • High Impact, Low Effort: The best ideas go here! • High Impact, High Effort: Further study is likely required. • Low Impact, High Effort: Probably best to avoid these. • Low Impact, Low Effort: Further study is likely required. 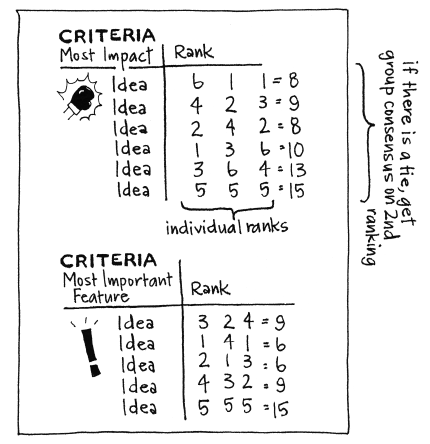 The light bulbs you will see at the upper left corner of the chart represent ideas. 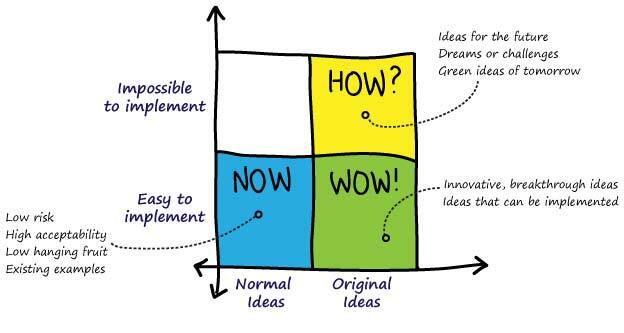 Simply add an idea to the chart by dragging a light bulb to its corresponding quadrant and describing what it is. All moves can be seen in real time by each participant, so everyone can collaborate to edit the descriptions and positions of the posted strategies. Communicate using the integrated chat facility to work together and form useful ideas. 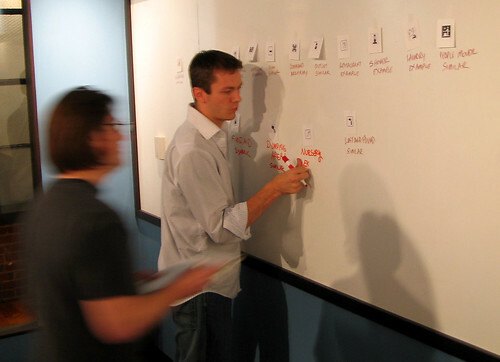 When prioritizing, a group may need to agree on a single, ranked list of items. Forced ranking obligates the group to make difficult decisions, and each item is ranked relative to the others. This is an important step in making decisions on items like investments, business priorities, and features or requirements—wherever a clear, prioritized list is needed. In this case, it would be best to rank items twice: once by impact and once by effort. Although there is no hard limit on the number of items to be ranked, in a small-group setting the ideal length of a list is about 10 items. This allows participants to judge items relative to one another without becoming overwhelming. By making the entire list visible on a flip chart or whiteboard, participants will have an easier time ranking a larger list. 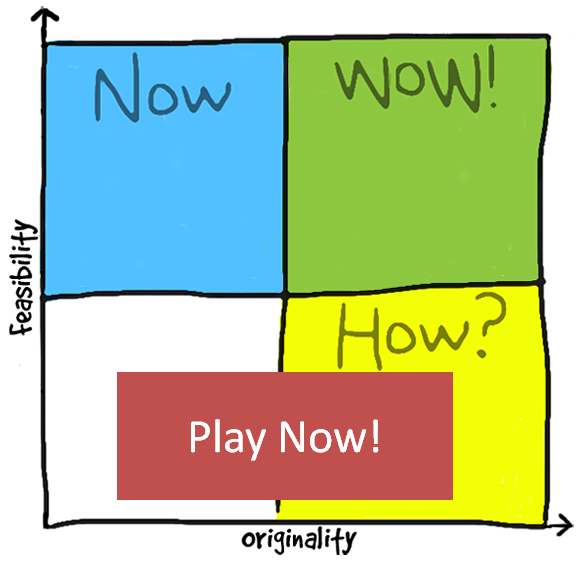 To play, create a matrix of items and the criteria. Each participant ranks the items by assigning it a number, with the most important item being #1, the second most important item as #2, and so forth, to the least important item. Because the ranking is “forced,” no items can receive equal weight. Once the items have been ranked, tally them and discuss the prioritized list and next steps. Creating a forced ranking may be difficult for participants, as it requires they make clear-cut assessments about a set of items. In many cases, this is not the normal mode of operation for groups, where it is easier to add items to lists to string together agreement and support. Getting people to make these assessments, guided by clear criteria, is the entire point of forced ranking. The original source of the Forced Ranking game is unknown.